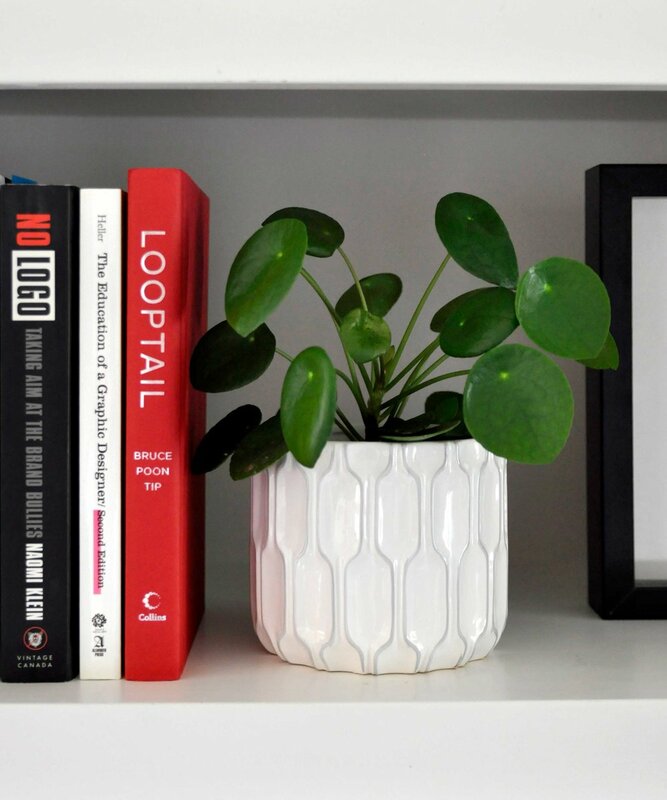 Swell Made Co. x Lovefresh | Freshen up Your Home for Spring GIVEAWAY. Spring has sprung! Or, has it where you are? Here in Ontario, Canada, it's still a bit too cold to feel like spring, but warmer temperatures are on the way. It's never too early to freshen up your home for the spring after a long winter. Say so long to flu season and winter mittens, and hello to more time in the sun and the breeze from open windows. We've partnered up with our friends, Lovefresh, to give you 5 easy tips on how to do just that. Freshening up your home for spring just feels so good. Plus, we have a fun giveaway to help one lucky person get ready for spring. Keep reading for tips and giveaway details below. Spring cleaning the green way with Lovefresh. The first way to get ready for spring is to lighten up! Truly. Put away wintery decor items and heavier linens and swap with bright and lighter items. Just like you would with your wardrobe (buh-bye winter gear), opt for things that will feel fresh and keep you cool in the warmer months ahead including bed linens, throws and even towels (like lightweight Turkish towels). Feels better already, right? Whenever I see bunches of tulips outside neighbourhood shops, I know it's spring and can't resist taking a bunch home. Springtime is all about new growth and greenery. Bring the outdoors in and add plants and flowers to your spaces. They help clear the air and your mind. A little greenery does wonders to make your home feel springy. Plus, with longer daylight hours, more humidity and warmer temperatures; your plants will thrive. 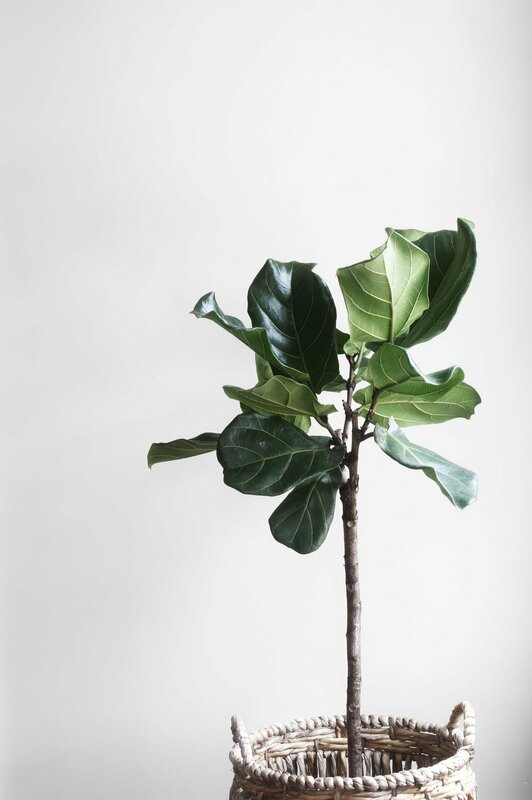 You don't need to be a green thumb to care for simple house plants such as succulents, cacti and low light plants like monstera, ferns and snake plants. Feel lighter by simply decluttering your home. It will bring peace of mind too. Get rid of (or put away) any items that are taking up space and aren't serving a purpose. 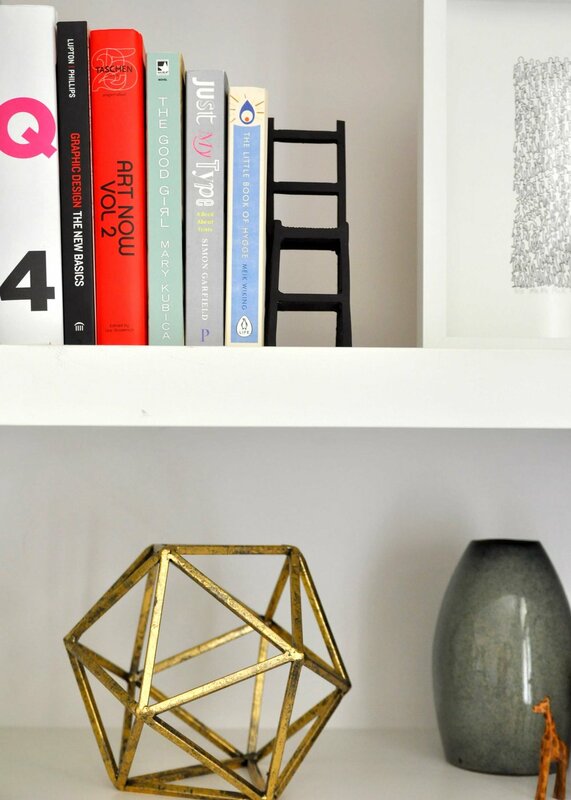 As mentioned in our past post about Wabi Sabi, clear the clutter and curate items in your home. Get rid of the items that impede you from enjoying your spaces. Less is more. The quickest and most cost effective way to overhaul your home decor is to add new (or swap out) throw pillows. New colours, patterns, textures and fabrics will instantly change the look of your space. It's a fun way to try something new in your space without a big commitment. For tips on how to style throw pillows, read more about that here. Swell Made Co. has some sweet options for your spaces. If you want to go a step further and are feeling ambitious, give your space a new coat of paint. Whether it's the whole room, or a feature wall. Nothing changes a space so dramatically (and quickly) as a new paint colour. The urge to do some spring cleaning is real. After all those winter months spent indoors, give your house a good clean the green way. Using products like Lovefresh's line of green cleaners helps maintain a healthy home and do good for the planet too. Lovefresh's line cleaning products is all natural, non-toxic and scented with the loveliest essential oils. And they're made in Canada. Throw pillow covers by Swell Made Co. Swell Made Co. x Lovefresh Giveaway - NOW CLOSED! Now that you're inspired to freshen up your space for spring, we're delighted to offer this giveaway with our friends from Lovefresh, a fellow Canadian brand that brings you natural and sustainable goods for the home and body. One entry per person. Open to Canadian and USA participants only. Giveaway closes at midnight EST on April 17, 2018. A winner will be drawn at random on April 18, 2018. Good luck and happy spring from Swell Made Co. x Lovefresh! Cleaning products for a healthy home from Lovefresh. Love It | Wabi Sabi Style with Swell Made Co.
Move over Hygge (we're still loving Hygge over here, though), 2018 will be the year of Wabi Sabi. Wabi-Sabi is a way of living that values finding beauty within life’s imperfections and accepting the natural cycle of growth and decay. What does this mean for your home? Wabi Sabi is quintessentially simple and comfortable. Embrace the not-so-perfect (wrinkles, cracks and dents are beautiful), organic and natural elements in your home. The concept and style of Wabi Sabi blends with minimalist and Scandinavian styles seamlessly. Organic Materials and Earthy Hues - Embrace organic materials that are meant to last (wood, wool, clay/pottery, bamboo or linen, stone, woven grass, etc.). Natural elements and hues bring the outdoors into your home along with a sense of calm and tranquility. Minimalist - Clear the clutter and curate the items in your home. Buying fewer, quality and meaningful possessions is key. Our spaces should inspire, rejuvenate and bring peace. Get rid of the items that impede you from enjoying your spaces. Less is more. Beauty and Utility Coexist - The best designed products combine form and function. Beauty and utility coexist. Whether it be a broom or a spoon. Fewer beautiful pieces in your home that serve a distinct purpose will help you simplify and bring happiness. Embrace Imperfection - Wrinkled sheets? No problem. Wabi Sabi style embraces the imperfections of life as beautiful and natural. Relax and keep it simple. Here are some ways to bring Wabi Sabi into your home along with Swell Made Co.
Gold Leaf (11x14) Art Print by Swell Made Co. Embrace the beauty of nature with this art print. Handmade Large Tote Basket by Mur Lifestyle. No two are alike. Made from dried palm leaves, this handmade basket is up to the task of holding anything in your home. Palo Santo Incense. Available from Woodlot, Palo Santo purifies and cleanses the air with the natural and energizing scent of Palo Santo wood from Ecuador. Brass Measuring Spoons. Perfectly imperfect brass spoons look beautiful, but serve a purpose in your kitchen. Gold Rimmed Pottery by Akai Ceramics. One of the simplest and beautiful ways to bring Wabi Sabi home is with handmade pottery. Adorned with a gold rim, these pieces are meant to last and they have a little panache. Saludo Wooden Serving Spoons from The Citizenry. Handmade in Mexico, these Tzalam wood spoons are perfectly formed by hand in the Yucatan. An effortless combination of design and natural elements that will be treasured for years to come. Black Coffee Pot by House Doctor. Get comfy at home with this porcelain French press. This Danish brand values personal and informal housewares that are made to stay. Black Wishbone Chair by Rove Concepts. The perfect combination of naturalness and practicality is the Danish wishbone chair. Minimalist and organic, this Danish chair complements the Japanese style of Wabi Sabi. Walk in the Woods (11x14) Art Print by Swell Made Co. Celebrate life and nature with this art print. Better yet, get outside and walk in the woods. Thanks for reading! If you're up for more inspiration, check out the Swell Made Co. boards on Pinterest. Just click the images above for sources. Love It | Velvet and Gold by Swell Made Co. Nothing says Christmas like vibrant velvet. 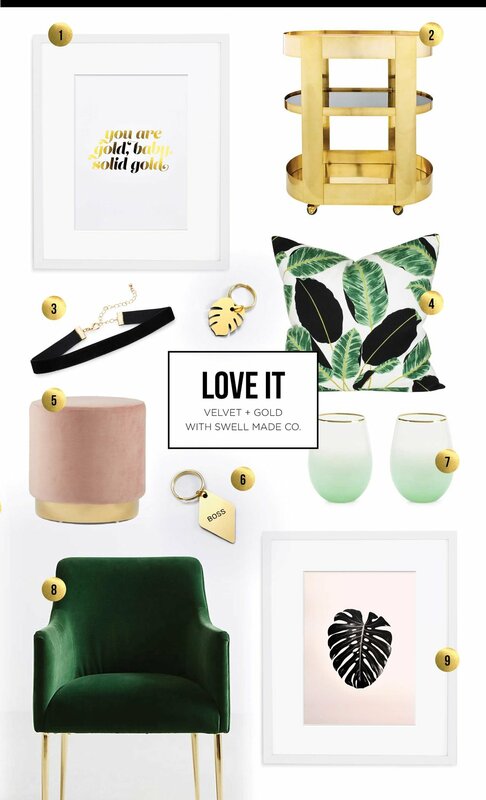 This holiday season I am crushing hard on jewel-toned velvet. Emerald greens, sapphire blues, blush pinks and burgundies (ruby reds are reserved for Santa) - all combined with the timeless glam of gold. It's a rich and luxurious combination, but it doesn't have to cost a fortune to bring it into your life. I can't help but think of holidays past with this Golden Girls style of the 80s. Fast forward to my "grunge days" (not to be confused with punk days) in the 90s; I remember feeling fabulous, albeit angsty, as I headed out for the season with a velvet baby doll dress and high laced Doc Martens. I'd love to get a hold of that dress now. So, here we find ourselves on the cusp of 2018, with this trend still going strong as jewel-tones promise to be a hit in the new year. Particularly cooler hues like blue and violet (or, ultra-violet as announced by Pantone yesterday). Enjoy this updated take on velvet and gold glam. Happy holidays, swell friends! 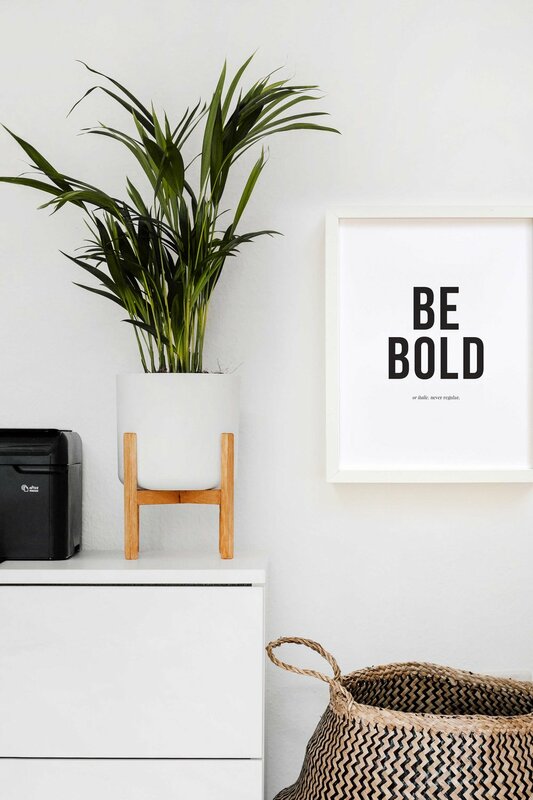 Solid Gold (11x14) Art Print by Swell Made Co. Bring some solid gold into your space with this simple art print. Paloma Brass Bar Cart by CB2. Mix drinks and mingle in style with a classic bar cart like this one from CB2. Combined with sparkly glasses and your favourite libations, holiday parties will be a breeze. Designed by Leonhard Pfiefer. Black Velvet Choker Necklace from La Maison Simons. Add a little velvet to your outfits with this simple velvet choker. Hojas Cubana, Rainforest Pillow by Tonic Living. There's something about velvet and gold that just begs for tropical patterns. Bring the tropics home with this pillow that's made in Toronto. Keira Velvet Ottoman by Structube. 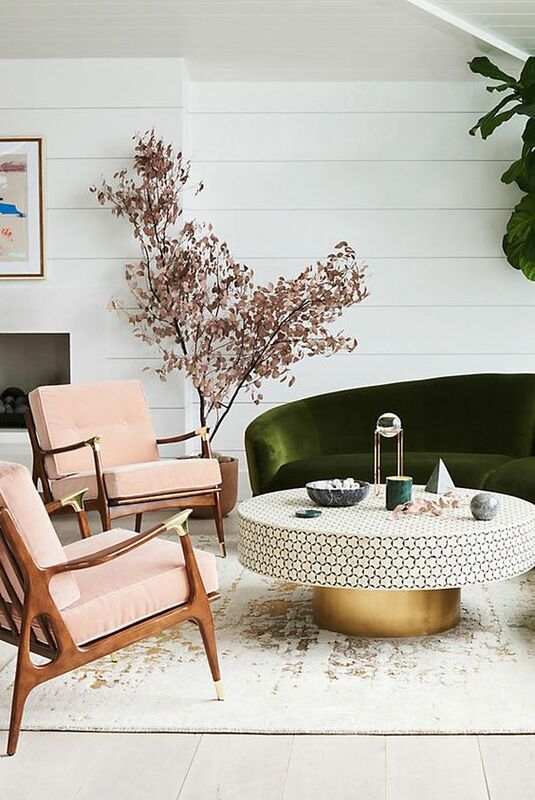 Available in a variety of jewel-tones, this foot stool is an easy and affordable way to bring chic elegance into your space without investing in a big ticket items like a sofa. Gold Acrylic Monstera and Boss Keytags by Swell Made Co. Glam, retro, simple. These gold acrylic keytags are a sweet way to adorn your keys and bags. Hang on the stockings, perhaps? Gold Rimmed Seafoam Ombre Glasses from the Cocktail Emporium. You've got the bar cart. Now, add the glassware and all kinds of accessories from Toronto's Cocktail Emporium. Also available in fuchsia and coral. Velvet Elowen Chair from Anthropologie. Another perfect combination of velvet and gold, these chairs come in a variety of bright colours to bring home. Whether it's at your dining room table, hall or office. Pink Monstera (11x14) Art Print by Swell Made Co. This blush pink art print pairs perfectly with this decor style (and many others) with it's versatile look. For more inspiration, head to Pinterest to see some of my favourite modern and bold spaces with velvet and gold. Click the images below to see the original sources. Thanks for reading!